Healthy male social environments have been almost non-existent and under-represented in the Western World culture for hundreds of years. Finally, there is now such a thing which is not only fit for the 21st Century but are successfully and voluntarily engaging men. This is the Men’s Shed and the first Scottish one opened in Westhill, Aberdeenshire in 2013. This is not your Shed at the bottom of the garden but a large building catering for many different social interests and skills. Due to this model being successfully replicated the Scottish Men’s Sheds Association, a Scottish charity, presently supports over one hundred and fifty voluntary led and independent Men’s Shed groups across Scotland. This level of male volunteering in Scotland over the last five years is an unprecedented success story for the grass roots movement with over five thousand men actively engaged and tens of thousands benefiting on many social and strategic levels. An understanding in the way people communicate with each other is different between the genders. By embracing our differences and catering for them has shown for the first time a voluntary willingness amongst men to engage and not self isolate themselves. This has been a health and social prescribing challenge for decades in trying to connect with hard to reach and marginalised men who have time on their hands. Male to male communication has been found to work best in a ‘shoulder to shoulder’ approach. A term understood and created in Men’s Shed psychology. This is avoiding eye contact until trust has been formed while working together on a task. 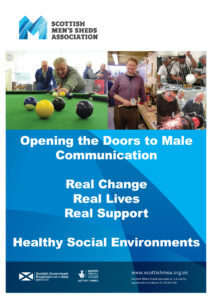 The Men’s Shed environment offers this unique socialisation environment for all men to voluntarily engage in purposeful tasks of their choice and engaging camaraderie. The Sheds are run by volunteers, not by agencies or councils and this gives the men responsibility and purpose which is lacking when not in employment. Men’s Sheds rely on the support of their communities by recycling and upcycling products and keeping wood and metal etc out of landfills, which is helping to reduce our carbon footprint. Repairing and making things for their local communities fosters kindness and community engagement on a whole new level for many men. As the Sheds become independent charities it requires men of all types to make it successful, utilising their past working skills and mentoring others in a compassionate and joyful way. Scottish Men’s Sheds foster intergenerational life wide and lifelong learning for all men over the age of eighteen. Whether men are getting out of the house to be engaged in a specific task or just going to have a blether with like-minded guys and relax over a cup of tea, isolation and loneliness is immediately overcome. Returning home to their partners with a new story and feeling they have accomplished something useful is helping their relationships and quality of life for all involved. The first official Men’s Shed started in Australia in the mid 1990’s originally to create a safe place for the Vietnam veterans who could not adjust back into their society. Now there are over one thousand Men’s Sheds in Australia with millions being invested through them into men’s health for the first time. Four countries in the world have recognised the benefit of having different male and female health policies. Australia and the Republic of Ireland being two of them and we hope Scotland will be the fifth to adopt these forward-thinking needs led strategies. 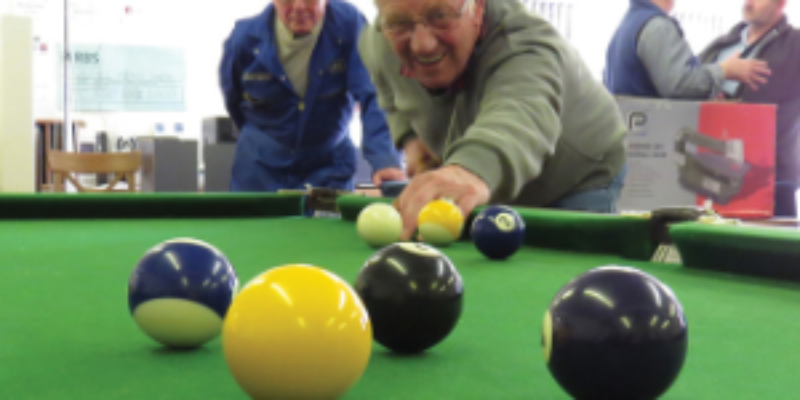 In September 2018 International Men’s Shed week was celebrated which incorporated over twenty countries now engaging in the Men’s Shed male health phenomena. The Scottish Men’s Shed Association is solely focussed on using the Men’s Shed model to impact on real lives and create real change by inspiring and supporting the creation of healthy male environments across Scotland. Jason Schroeder is the Executive Officer at Scottish Men’s Sheds Association.